Simon Says Tag You’re It! Make a tag or add a tag to your creation! This week we are showcasing Ranger Products this week. You don’t have to use them for the challenge but if you have them we would love to see them used. 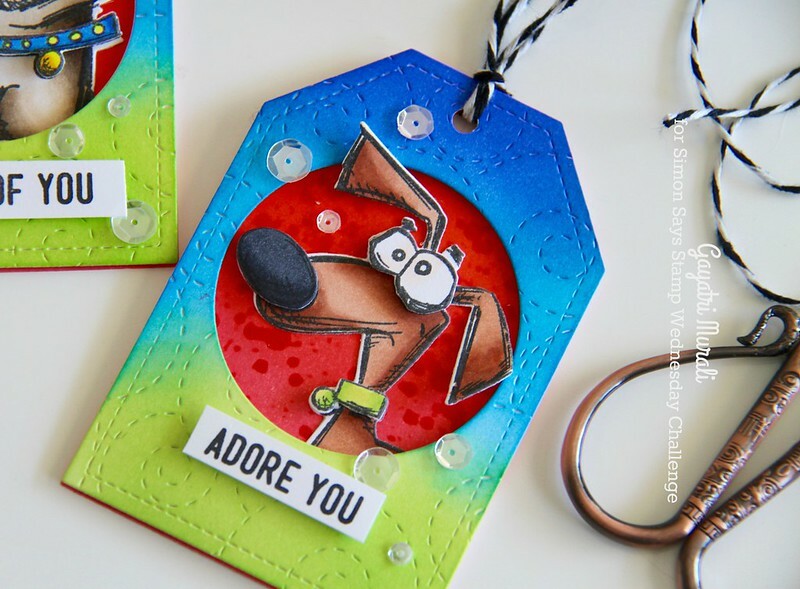 I made two tags using the Crazy Dogs stamp set and coordinating dies. I am a dog person and so this set is dear to me. 1. I used Pretty Pink Posh’s Stitched Tag die to die cut four tags. 2. I ran two of the tags through using the Simon Says Stamp stitched Whirl die and die cut a circle out of the middle of the tag. 3. I sponged Twisted Citron, Salty Ocean, Mermaid Lagoon and Blueprint Sketch distress inks on these two tags. 4. On the other two tags, I sponged Worn Lipstick, Abandoned Coral and Ripe Persimmon distress ink. 5. I used the Tim Holtz’s Speckles layering stencil on these two tags and sponged Candied Apple distress ink to add texture to the tags. 6. 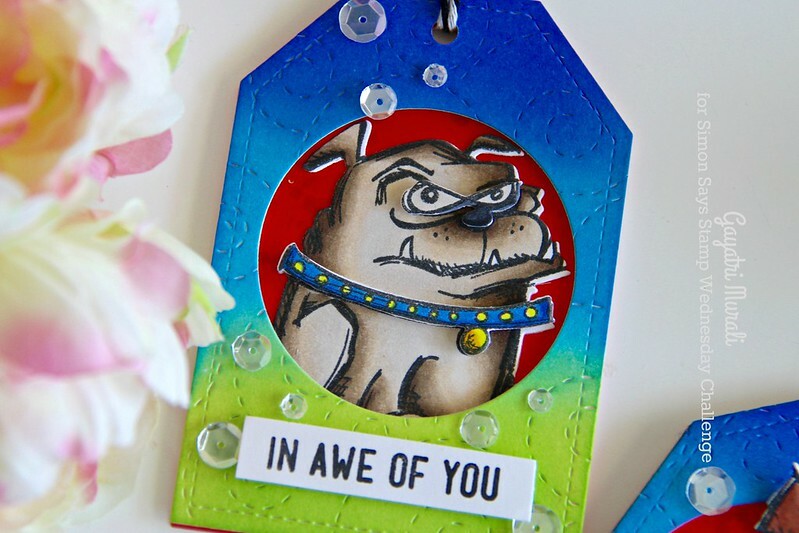 I stamped two dog image from Crazy Dogs stamp set and copic coloured them. I used the coordinating dies to die cut the image and their eyes and collars. I adhered the eyes and collars on the main image of the dogs using foam adhesives. 7. I adhered the dog images on the pink/red sponged tag and the blue/green tag is adhered on the top using foam adhesives. 8. The sentiment is from an older Simon Says Stamp unfortunately it is retired now. 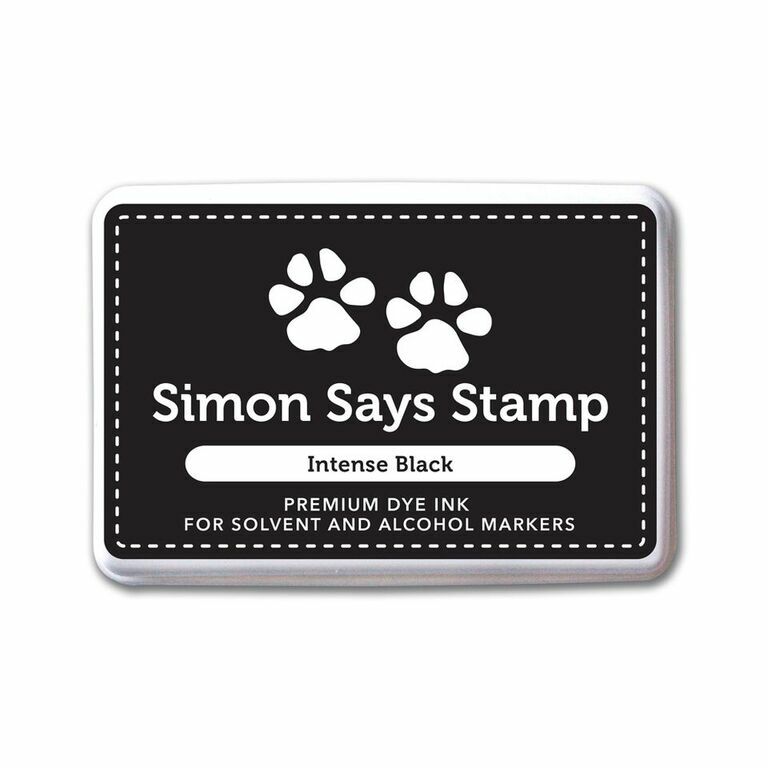 I stamped the sentiment using Simon Says Stamp Intense Black ink on a strip of white cardstock. 9. Finally embellished with Pretty Pink Posh Sparkly Clear sequins and black and white baker’s twine. Here are some closeup of the tags. Too cute, Gayatri! Love the etched swirls and the bright colors! 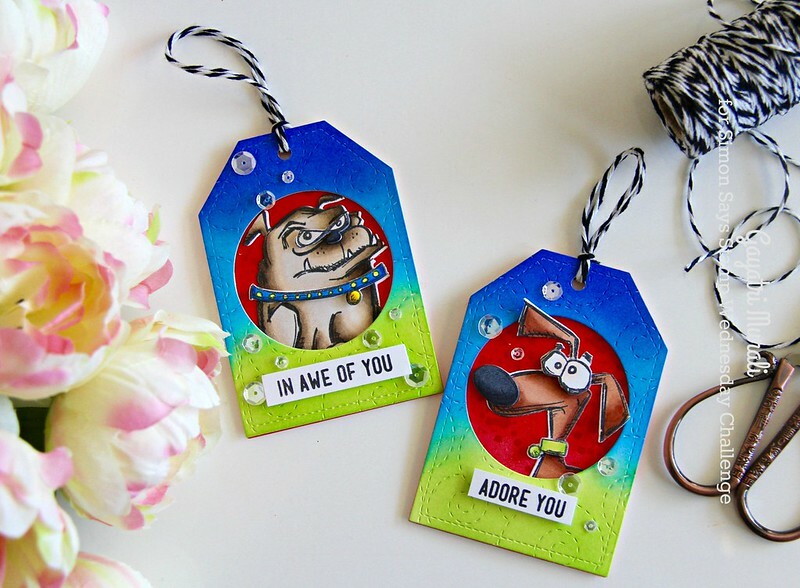 LOVE the vibrant colors and fun design with these pup images, Gayatri! Great tag size and shape as well. Super cute tags!!! Love the super bright colors! !